I'm interested in our recent interstellar visitor 'Oumuamua. Whilst I'm happy to accept the official explanation of what it is, I'm curious about what state it would be in if it was actually alien space junk that's been drifting for hundreds of millions of years. Assuming it started as a recognizably artificial structure, after 100 million years would it have been affected by micro-meteors? Would it have accumulated a coating of 'space dust' in its travels? Would it still be recognizable as an artificial structure after all this time? The NASA site I linked suggests it's about 400m long, 40m across, irregular in shape, has a rocky surface and is reddish in colour. Wouldn't this description also apply to a chunk of space junk that has collected accumulations of space dust held together by micro-gravity? If it was alien space-junk how close would it have had to pass to earth for us to recognize it as such? Apparently it passed at a range of 200 million kilometers, so I'm guessing no one really managed to get a very good look at it. The paper Could Solar Radiation Pressure Explain 'Oumuamua's Peculiar Acceleration? published in The Astrophysical Journal Letters (Shmuel Bialy and Abraham Loeb, 868, 1, ) can also be viewed and downloaded in preprint form from ArXiv. 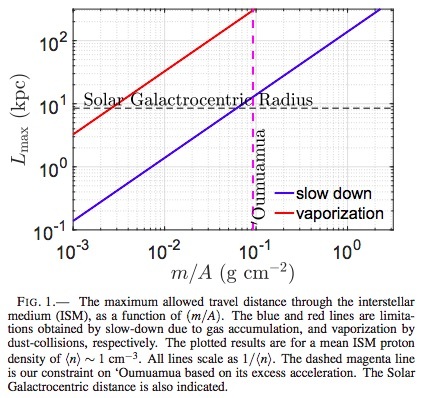 We explore the possibility that the excess acceleration results from Solar radiation pressure. The required mass-to-area ratio is (m/A) ≈ 0.1 g cm−2. For a thin sheet this requires a thickness of ≈ 0.3−0.9 mm. We find that although extremely thin, such an object would survive an interstellar travel over Galactic distances of ∼ 5 kpc, withstanding collisions with gas and dust-grains as well as stresses from rotation and tidal forces. We discuss the possible origins of such an object. Our general results apply to any light probes designed for interstellar travel. The article does not describe the amount of accreted material on the surface, nor the resulting optical properties. Therefore visual cues like color would be a poor way to try to distinguish an artificial from a natural body after an interstellar trip like this. However even for thin shells of material ≈ 0.3−0.9 mm considered here, the paper concludes that the underlying material would remain intact. This means that if one could explore bulk properties, a lot could be determined. A long-distance impactor could also be used to induce hot vaporization of material that could then be analyzed spectroscopically. This technique has been demonstrated in several cases with both natural and artificial impactors. might be just a few (mostly) non-contact methods that could be used to address the composition of 'Oumuamua and to address the question of it more likely being of natural or artificial origin. NOTE: This Astrophysical Journal Letter is densely written, full of math, and heavily sourced. I've just captured a few "sound bites" from it, but the reader is encouraged to dive in to the ArXiv version first, before asking questions about the paper's conclusions. Evidently, ‘Oumuamua can travel Galactic distances before encountering appreciable slow-down. For our constrained value for the mass-to-area ratio, ‘Oumuamua can travel through the entire galaxy before a significant fraction of its mass is evaporated. Evaporation becomes important at higher speeds. When an object travels at a high speed, collisions with atoms in the ISM can potentially transfer sufficient energy to produce sputtering... At higher speeds, the yield increases but typically remains below 0.01 (Tielens et al. 1994), thus at any velocity, vaporization and slow-down remain the dominating processes limiting the allowed distance an object can travel through the ISM. Cosmic-rays are expected to cause even less damage. Although their energy density is comparable to that of the ISM gas, they deposit only a very small fraction of their energy as they penetrate through the thin object. Thus, even when self-gravity is ignored, ‘Oumuamua can easily withstand its centrifugal force. Thus, unless ‘Oumuamua encountered an extremely close approach to a star in its past, it is unlikely that tidal forces played any significant role. For a planar geometry and typical mass densities of 1–3 g cm−2 this gives an effective thickness of only 0.9–0.3 mm, respectively. For a material with lower mass density, the inferred effective thickness is proportionally larger. We find that although very thin, such an object can travel over galactic distances, maintaining its momentum and withstanding collisional destruction by dust grains and gas, as well as centrifugal and tidal forces. Not the answer you're looking for? Browse other questions tagged interstellar-travel asteroid debris or ask your own question. Examples of gamma ray or X-ray imaging of small planets, moons, or asteroids, or at least how to calculate intensity thereof? 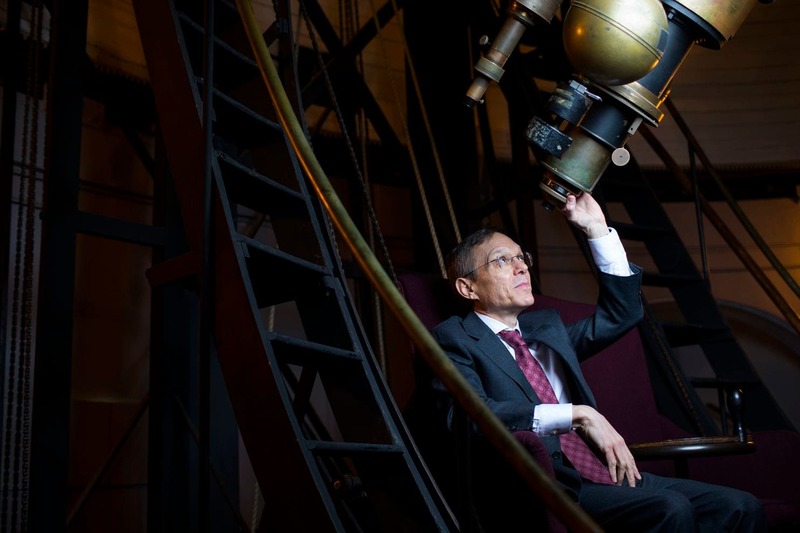 What liability do commercial space firms have for abandoned space junk? What actions are performed to prevent i.e. ISS from getting hit by space junk? What is the biggest piece of space junk? Is there a database for space junk beyond Earth orbit, and is Roadster in it? Wet space junk and flotsam washing up on shore, will it get worse, is there a plan to mitigate?